Where In The World Is Western Civilization? When I talk about the part of the globe that is Western Civilization, I mean from the Tigris/Euphrates valley to the Mediterranean to Europe to the Americas. Western Civ was born in Mesopotamia, the land between the Tigris and Euphrates Rivers in the southern part of Iraq. Civilization spread westward from there to lands around the Mediterranean Sea: Egypt, Israel and Phoenicia to the city-states of Europe and northward to the British Isles. From there it extended to the New World—the Americas and Australia. So, Western Civ is made up of many people and cultures. It grew from the first civilization—the Sumerians in Mesopotamia—to the Egyptians; the Jews; the Greeks; the Romans, whose empire split into east and west; the western half of the Roman Empire became the Holy Roman Empire which reorganized itself into separate European countries. Some of those countries in turn created empires mainly by colonizing the New World. The British Empire includes Canada and Australia. The United States of America declared its independence from Britain in ad 1776. Of course there are other non-western civilizations around the world today and throughout history. This history is simply about Western Civilization. Most important to me are the ideas. How did ancient people develop an alphabet? Whose idea was it to smelt copper and tin together to make bronze? How did they come up with literature that we still read today? How did they figure out how to measure time, or the circumference of the Earth? 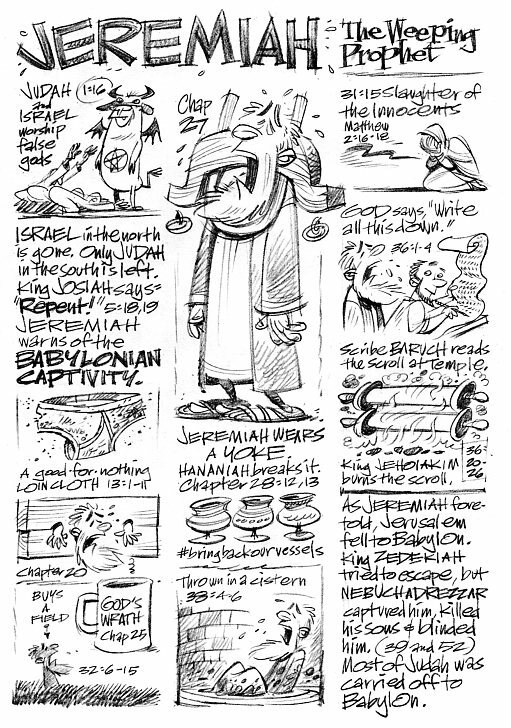 Sunday school tomorrow—here’s the second of our Major Prophets of the Old Testament, Jeremiah. Of the four, Jeremiah is probably the gloomiest. Although God promises sunnier days ahead once He’s finished punishing Israel & Judah for their sins, large chunks of this 52-chapter book + Lamentations is about how the Chosen People have gotten seriously off the rails. Don’t gloat—how well-behaved have we been lately? Jeremiah has been called the ‘weeping prophet’. So much that his own people could hardly stand him and were forever throwing Jeremiah in cisterns and jails. Who can blame him? He witnessed everything he loved and took for granted be swept away. Most of the things Jeremiah foretold came true in his lifetime. Last week we met Isaiah, whose prophesies about the virgin birth and Messiah wouldn’t come true for 600 years. So far as I can tell, only one bit of Jeremiah foretells New Testament events—31:15 is thought to predict the slaughter of the innocents found in Matthew. Jeremiah is believed to be the author of 1 and 2 Kings, where you can read about how—starting with Solomon—things unraveled.